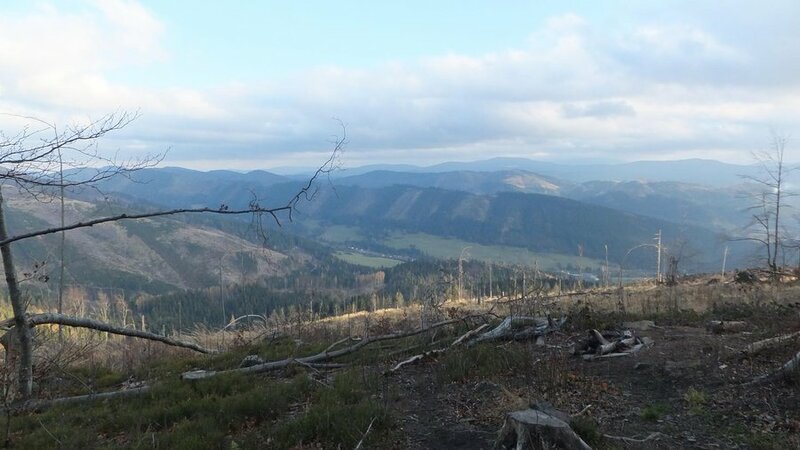 That weekend we decided to hike to Wielka Racza (1236 metres) and sleep over in mountain hostel on the summit. Wielka Racza's the highest mount in Żywiecki Beskids. It was very pleasant trip. On the first day the weather was perfect. It was sunny November day, a bit cool already which made walking uphill easy. There wasn't many people on the trail, which was another good thing. We took the green trail starting from Rycerka Kolonia . It's not only hiking path - you can go there on wheels as well. Later on the trail divides into one for hikers and one for bikers so it's good to look attentively on the symbols on trees. On the way we stopped over in mountain hostel on Przegibek (1000 metres) to have a quick snack. Next day the weather got worse. It was raining and didn't look like getting better. We decided to stay in the hostel until afternoon. We weren't bored - had with us board game called 5 Seconds (you need to answer a question in 5 seconds which is quite a challenge sometimes! ).